Four years ago triple Olympian Simon Mason accepted an invitation for GHC to participate in one of Europe's top youth tournaments. The Polo Club de Barcelona is one of Europe's best clubs and has produced more than 50 Spanish Olympians. This year the tournament included 88 teams and more than 1050 players from across Spain and Europe. Or perhaps it was sitting in the hotel with representatives of the Kazan side (a 14 hour journey east of Moscow if you have never been there on holiday), discussing hockey through an interpreter whilst they were helping themselves to the £35 bottles of wine that Anthony had just purchased at the hotel bar (and that, by the way, was the cheapest bottle on sale!). As Anthony's face drained of colour ('£35 would get you a good semi-detached back in Burnley' I'm sure I heard him mumble to himself), he must have cheered up when we were all kindly invited to a hockey tournament in Kazan in April. This was announced by the Kazan representative in a speech that was almost Churchill like in its quality and content as he announced to a crowd of stunned parents………”You come to Kazan, we look after you….You eat, you drink…” and then offering other services that perhaps are not ordinarily associated with a GHC family hockey tour and is guaranteed to not get the green light for the tour from our CRB officer! Speaking of the Russians, next time we meet I'm making sure I don't sit next to Hamish as apparently he told them that I was a distant relative of Prince Charles and I then spent the next 20 minutes or so trying to explain to them that I had no opinion on if and when the Queen should abdicate or whether I liked Camilla as a person! No doubt it was a tough draw to face the host A team in the first group stage match. RC Polo have a lot of depth in the age group (in all age groups!) not to mention the advantage of not having got up at 3.30am local time to travel to the match (they were probably only getting to bed at that time). The intial loss was disappointing because the match was never really a foregone conclusion, never really out of our reach. But Polo had strength and speed and our team were finding their feet on foreign turf with a combination of players who had probably not played as an 11 this season. 0-2 turned out to be a decent score given that Polo went on to win against two teams in the group 6-0 and 4-0 and the other 3-2 and then went on to win the tournament. Guildford came second in the pool thanks to their three wins, including a narrow win against the Russian team who were increasingly frustrated not to be able to score against us. It was us or them for a chance at a podium place in that final group stage match and 1-0 sealed the deal. Guildford were into the play-off for 3rd/4th place. The boys enjoyed a late dinner after the Kazan match that had started only at 21.20. Slowly adjusting to Spanish timing and enjoying a late night before what was certainly going to be a lie-in...suddenly showers were running and the breakfast room was busy as the boys realised they were on at 10.20am! Four group stage matches into this tournament, the boys were operating as a team having been expertly coached by Steve and David from the sidelines. Benji, Ben Finn, Cam, Tom controlled the ball well at the back, scuppering any attacks and switching it effectively. The midfield battles were won with James and Josh having very good games. Ben R worked tirelessly to keep the ball up front and create chances with Ross and James running on to several balls. Harry A also put in good shifts when needed and Harry F was solid in goal and supporting the team with his voice from the back. One goal was enough but the Guildford spectators were holding their breath for ten whole minutes as Guildford played 10 v 11 for most of that time, their talisman in midfield having been sent off (to join his coach who had had the honour a few minutes before him!). 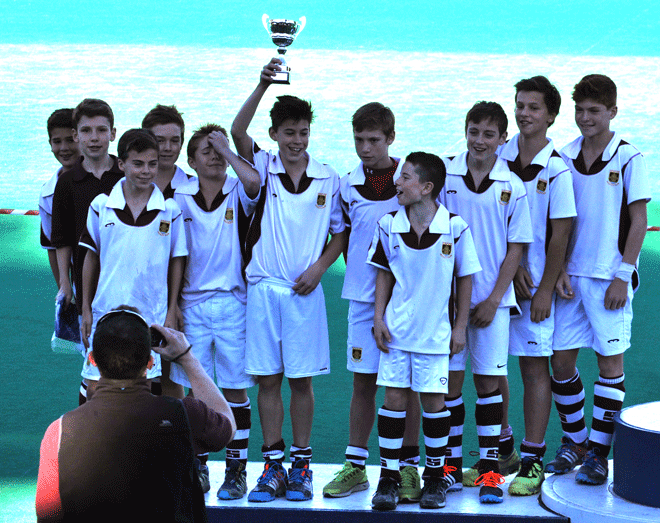 A deserved win and 3rd place trophy for the boys whose determination and tenacity really showed. They lost only one match to the eventual tournament winners. Very well done. It was a pleasure to see them develop their hockey over the three days and also a pleasure to have been around them this weekend. Many, many thanks to Steve and David for coaching and looking after them and to Pippa for helping organise things in the background before the tour. Like the U16 Boys, the girls' first match was against the Polo A team, our girls of course having flown, checked-in to the hotel, changed and downed some pasta for lunch. 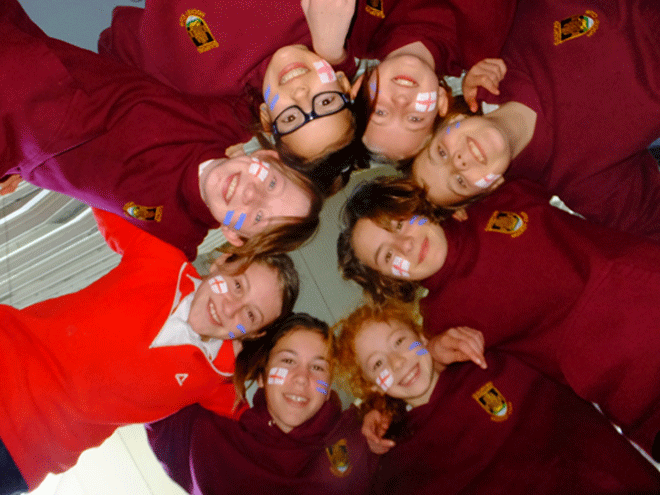 It was a difficult match but the girls to their credit never let their heads down and kept battling to the end. They hadn't yet found their groove in the first match but started coming into their own with a draw against eventual group winners, Junior FC in a match that could have gone either way. A good win against Campo B and another draw against RS Tenis meant that they were tied with RS Tenis on points in the group and it went down to goal difference to decide the places in the pools. They just missed out on 3rd place in the pool which meant a play-off for 7th/8th place. The games in the pool were so close that the end placement doesn't matter nearly as much as how well the girls played both as individuals and with and for each other. They were a real credit to Guildford Hockey Club and it was very special to have them join the boys on this tour for the first time. Well done to Olivia, Anna, Rachel, Hannah E, Hannah E, Niamh, Alice, Mia, Eloise, Hannah W and Hannah W (no joking, there were four Hannah's!). And huge thanks to David Dickson and Mo Rahman for coaching the girls and also to Sarah Egerton for organising the squad and helping Dave and Mo look after the girls so well on tour. We are starting to see a pattern here as the first match for the Under 14 boys was against...RC Polo A. Last year the Guildford boys came third in the U14 competition (tied with the second place team on points), having lost to Polo A in what could have been considered a final match (if they had beat Polo A they would have come first). So, the pressure was on and the boys were just off the plane (you know the story by now). The boys would, of course, want to better the third place of the year before but they knew it would be tough. Having been up since 4.30am UK time and having spent hours getting to the tournament, the first match against the favourites was always going to be a tough ask. The boys started the game much the better side and battered their opponents in the first 10 or so minutes. There was some excellent, confident passing and we looked a really good side and the hosts were pinned back into their own third while shot after shot went wide or high or was saved. There were at least 3 penalty corners in the first few minutes and from one Max nearly scored with a shot saved by the keeper. Further chances by Isaac and Elliot were missed and in reality we should have been at least two goals up before the game changed when a ball lofted out of our defence was met with an opposition stick reached well three feet above head height that would not have been allowed in England. No whistle and the boys were a bit too slow to react to the quickness of the counterattack. We won the ball back on the edge of our area but lost it and left their striker with an easy finish. The boys then lost their composure a little, sometimes trying to pass the ball through a crowd and subsequently went 2-0 down a minute or two later. The boys' heads went down a little and the game finished with a 2-0 loss. It was apparent that Polo were not a better side but they managed to score the crucial goal first and perhaps our boys did not respond well enough to going behind. This was a must-win for the boys if they wanted to get into a good play-off after the group stage and it was noticeable from their warm-up that they were determined to bounce back from the Polo game. Within two minutes we scored a crucial goal that restored our confidence as Max scored with a fine shot from the edge of the D. After taking the lead we then took control of the match and played the ball around with real accuracy and speed. Marco scored the second, Isaac scored the third and then a brilliant run from Max set up Isaac again for our fourth goal. We then scored an excellent goal when Marco beat several players and set up Isaac again for his hat-trick and the game finished 5-0. The next morning, in bright sunshine we faced Jolaseta's B team. We realised that we now had a good chance of coming top of our group as Polo had lost one of their games and everyone was beating everyone else in a very tight group. The game started and we almost scored immediately with Elliot shooting wide. Max then scored the opener with a great run and shot and then shot wide after another great move. 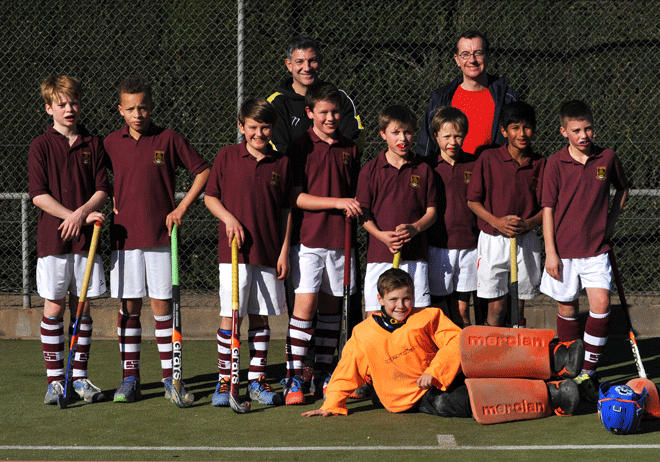 We were playing some excellent hockey with Max outstanding and Marco and Raphael having excellent games. After a good run by Raphael, Elliot finished to make it 2-0, Elliot and Jake had shots saved, Isaac made it 3-0 and the fourth was an own goal after a lovely pass by Jake led to the defender knocking it past his own keeper. Great performance by everyone and a really good win. The defence were key to the positive attacking style the whole team were able to play in this match as they were in the RS Tenis match the night before and the Campo match coming up. The opposition attacks were thwarted effectively and the ball was passed with speed and accuracy using the width of the pitch. A real pleasure to watch. We entered the match knowing we had to win by at least 2-0 to proceed to the final. The boys were really 'up for it'’ and this was probably their best performance of the tournament. Marco scored early on in the game with a lovely finish, Elliot missed with a shot, Isaac shot over the bar, Max had a shot that was saved and the all-important second goal came when Elliot made a great run and pass leading to Marco scoring his second. Club de Campo came back and Alex made two good saves to keep them out. A good run by Max led to Isaac finishing well for the third and probably our best goal of the tournament was scored when a one-two between Max and Marco led to Marco finishing for the fourth goal. This was a very good performance from the side with Marc, Ollie and Ben all having their best games and Harry in particular displayed his passing ability. Max however stood out for his running ability with the ball and for scaring to death the Campo defenders with his speed and dribbling skills. The boys had responded magnificently to the defeat in their first game and had come back to win their group and were now in the final. They knew they had to play a good Jolaseta A side who had won their group and it was likely that the game was going to be really close. We had watched their final group stage match and they had watched ours. A change of tactics was employed to try to neutralise their 'Rafa' and we are pretty sure they had had a good look at what to do about our Max. After a bit of a stand-off as to which side would play into the sun (resolved by a toss of the coin) the game started and again as in the Polo match, for the first ten minutes we were the better side. At one critical juncture Jolaseta were attacking and at the edge of our D, Raphael tackled and was fouled. He took the free hit immediately in Spanish style catching Jolaseta off guard and whacking the ball up to Isaac who secured a PC as he took it into the D with the Jolaseta boys panicking. We scored a very good goal from the PC with Ollie’s goal-bound shot deflected by Max into the net to put us 1-0 up. Isaac then had a shot that went just wide of the far post. If that or any of the many early chances or PCs had gone in, the game would probably have been all over, however, hockey players are human and Spanish rules are different and our strategy was not foolproof: a couple of goals went in against the run of play. With Jolaseta coming back into the game, their midfield player ('Rafa'), from the top left of our D struck the ball across our area. The first defender put his stick to block but only caught an edge and the ball got through to the second defender who swung and narrowly missed and the third tried to trap the ball with his stick but also missed. The ball ended up at the back post, the goalkeeper not able to react in time and the onrushing Jolaseta attacker put it in to equalise. The chain of errors had allowed the opposition back into the game. This set-back made us lose our shape a little and with the strategy of marking 'Rafa' exhausting some of the players and Max contrariwise being effectively marked by the opposition, within a minute or two we were 2-1 down with another goal being scored against us. The umpire awarded us a free-hit on the 16 yard line. Marc, who was in the left hand corner not really very close to the 16 yard line, was in the process of giving the ball to Raphael (who was near the 16 line) for him to take the hit but before we had control of the ball to take the 16, the Jolaseta player, who had not been 5 yards to start with, rushed in and took the ball off of us and dribbled through with our players caught between trying to get the ball back and trying to explain to the umpire that the hit hadn't been taken and that the oppo player hadn't been anywhere near 5 yards away. It is one of those learning experiences of playing abroad - a goal like that would not have been scored in the boys' league or cup back in England where free hits are not taken so furiously fast and without regard to whether or not the oppo are at the right distance (though it had worked to our advantage earlier in the match when we got the PC and scored our goal). As in the Polo game, we did not respond particularly well enough to going behind and Jolaseta had two more chances that Alex saved. The boys made one last effort to save the game but Isaac's and Max's shots were saved. The game ended with a 2-1 loss but the boys to their great credit were very magnanimous towards their opponents in defeat and achieved second place in the tournament. Jolaseta were not better than we were but they were a good side and there was no shame in losing such a close match by the odd goal in three. The boys went up on the podium to receive their runners-up trophy and they had done very well throughout the tournament against some good quality sides. 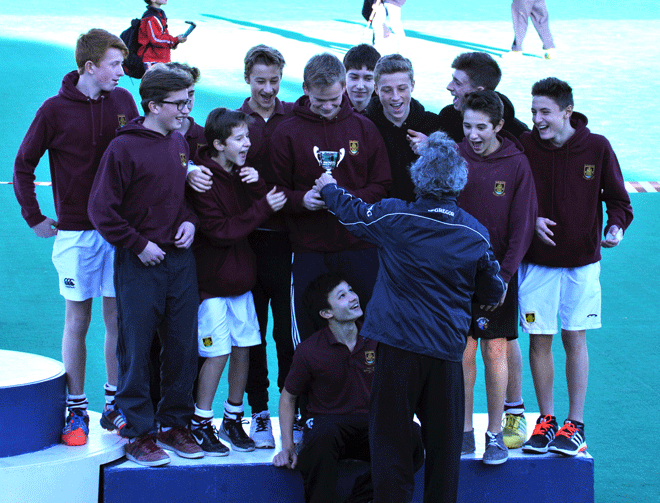 To receive the trophy was a considerable achievement and the boys did themselves proud. All the boys in the squad performed well and I am sure have come away from the tournament as better and more experienced players. Special mention to the coaches, Gary and James, for preparing and motivating the boys so well and for achieving such a good result in trying circumstances. They should be proud of coming back home with another trophy. Thanks also to all those who worked so hard to organise the trip and to the parents and players from the other Guildford sides who gave us such magnificent support. The warm up didn’t go quite according to plan when poor Esta came down with a mystery illness, and her batteries went flat 15 minutes before the game. With only one sub with us in Barcelona, that left us with precisely...no subs. Large orange tablets were swallowed and fingers crossed for no injuries with our remaining 7 players. Play started with a barrage of attacks from the home team, somewhat taking us by surprise, given what we have often faced at home. Our defensive line up of Mille and Giorgia did a great job at keeping the attackers at bay, but occasionally they broke through and Raphaella made save after save, keeping us in the game. The midfield line up of Sophie, Ariane and Lucy scooped up the clearances and tried time and time again to get the ball to Floss, who was immediately closed down by giant of a girl, who seemed to be able to cross the pitch in a few bounds. The game carried on much like this for the next 15 minutes, when Esta appeared to awake from a semi coma and re-booted. With a big smile said she was ready to go back on the pitch and entered the fray. Unfortunately this was not enough to make a difference, and eventually we cracked under the barrage of attacks letting in one goal to finish 0:1 down. This, in the circumstances was an outstanding achievement, given that Polo A ended up as the eventual tournament winners out of 12 teams. This match turned out to be our highest scoring game where some of our best drills came to their fore. After just a few minutes we won a short corner. Floss injected to Ariane who shot wide but Floss picked it up and sent it back to Ariane who passed back again to Floss who swept it in the goal. Next Millie had a go, having apparently hypnotised the opposition into a stupor she ran the ball right around the D, got herself into shooting position, reverse stick shot, just wide. Then a shot on goal was denied when the GK sat on the ball and the second goal 2 game from an almost identical re-run of the first. Goal 3 came from a shot from Ariane and deflection from their player, and then Millie had another near miss. Giorgia took a restart from the sideline, Millie made a penetrating run, passed to Lucy who’s shot just steered around the goal. Lucy and Sophie both had more shots on goal but couldn’t quite convert. Our final goal came when Ariane had taken a well earned break, and came back on and within 15 seconds had drilled it in the goal for a 4:0 victory. Having fed Esta a few more large orange pills a tactical hour before the match to buoy her up again, we had a pre-match chat. Dave talked tactics, speed, passing all that good stuff. Giorgia had some questions but first laid out a plan….Esta could pass the ball to Ariane who would take it up to the D and hit it in the goal like yeah wooooo! The excitement of that seemed then to confuse her and so she asked David if he could tell everyone their "pyjamas." Turns out she meant "positions." With all that behind us we started on full strength, and came out fighting from the first whistle but Giorgia’s optimism was misplaced. We did prove how hard we can be to score goals against with our defensive line proving hard to break, with the ball rarely troubling Raph who dispatched the few goals coming her way with ease. Our game progressed and we started to launch some attacks. Esta and Giorgia repelling the defence, Ariane putting in some great block tackles, Mille launching some great runs, Lucy and Sophie alternating in right half, running up the right wing, Floss whirling like a dervish (what is a dervish anyway?). So despite having put in a spirited performance the game ended in 0:0 draw making us second equal but which gave us a nervous wait to establish our final position in the pool of 4. A cruel twist of fate having conceded only 1 goal in 3 matches, Jolaseta had beaten RS Tenis by 6 goals, so on goal difference we were 3rd placed going into the play off finals, putting Jolaseta in Pool E against the other teams who had come 2nd and us in a Pool F with other teams that had also finished third in their intial pools. Highlights of the Polo C game were that it turned out to be a gutting 0:0 draw meaning that in 4 games we had conceded just 1 goal. Raph made many saves, but the best has to have been a kneeling save, which she then managed to secure by trapping the ball in her pads, after which she was never really troubled. Despite numerous runs, neither team really had many chances. Millie probably had the best chance of all. Esta came back on strong (more orange pills perhaps?). Sophie, Lucy continued to make penetrating runs, Floss pushed the ball forward with Millie taking up centre forward position. Ariane was strong as ever in centre position. Guildford really looked the better team against Polo C but just couldn't get the ball in their goal. In keeping with their record of the Pool A stage, they defended well and Raph came into play a few times to make sure nothing went in against us. They were doing all of the right things, good tackling, passing wide, creating space, but the shots were not getting through and the opportunities to score dried up. A draw was ok but disappointing when we knew our girls looked at times during the match like the better side. Our final match came against Campo who turned out to be a really strong team - they must have been in a strong initial pool to have come third and into the third placed teams' play-off. Campo's first goal was a blinder which was virtually unsaveable over Raph’s head just below the bar. 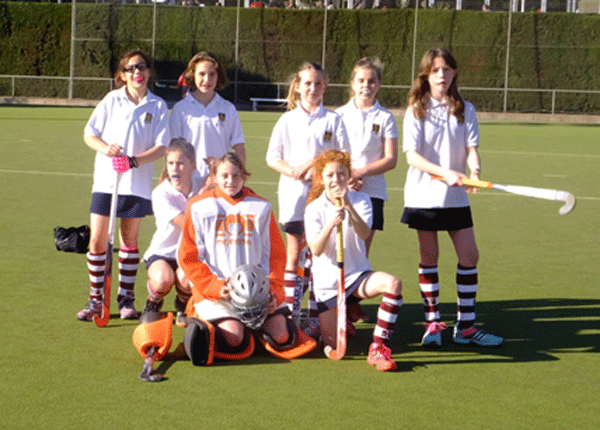 We picked up the pace and the coaches agreed the girls played their best hockey of the tournament but somehow managed to concede 2 more goals. Our previously impenetrable defensive line was broken just twice from which Campo profited both times. So five matches in 48 hours is pretty big ask but throughout our girls showed fighting spirit, and worked hard as a team. A few non-hockey highs and lows? 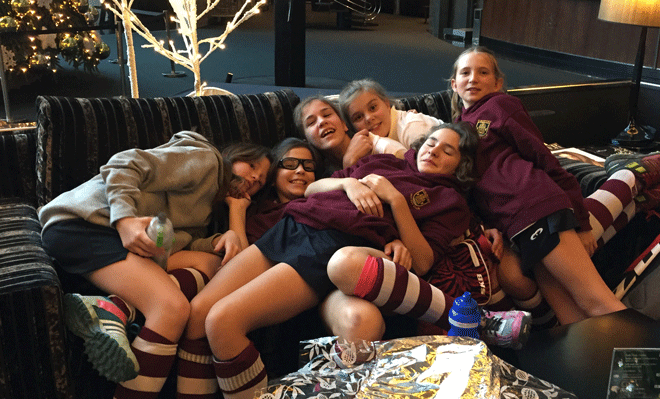 A good time was had by all and despite losing the final match that impacted their impressive defensive record up until that point, the girls learned a lot during the weekend and had a great time. They were a pleasure to look after and really enjoyed each other's company. It was also very special for them that Giorgia celebrated her birthday on the Saturday with them, cake and all! They were also very good supporters of the other GHC teams. Here we go once more with Guildford in Group A (again), with RC Polo A as their first opponents (again). By this time all four of the Guildford teams who had played Polo A teams in their first matches had lost and with this latest match not going our way we were now 0-5 for matches in the tournament with a -12 goal difference! A baptism of fire but that's why we come to Barcelona - for the challenge of playing strong teams. And we must take it as flattering that the hosts wanted to play Guildford in each of their opening A team matches. The boys then played RS Tenis and suffered a narrow loss in a match they should have won, putting them third in their pool of three which placed them in the 'Plate' competition for 13th-18th place. The boys tournament was structured with 6 intial pools of 3 and in order to progress to the more competitive pools, one needed to win the first pool or at least come second. Having come third meant that the boys, who were by now well warmed up, were able to score unreservedly against the two teams in their play-off pool. The emphatic wins of Pool 5 placed them into the play-off for 1st/2nd place in the 'Plate' and the boys won easily against the Jolaseta C team. The boys' tournament was a strange mix of one really tough match, a match they should have won but didn't and then three goal-fest wins. The boys had a great time and learned a few lessons along the way. Many thanks to Sean and Mat for coaching the boys and looking after them on tour and to Caroline, their squad manager, who helps tirelessly behind the scenes week in and week out and who helped on tour as well! Just before the dust settles I wanted to thank you all for the various parts you played in getting us all to Barcelona and back. I appreciate how much work has gone on behind the scenes to make this happen. This has been another great Tour for the players. 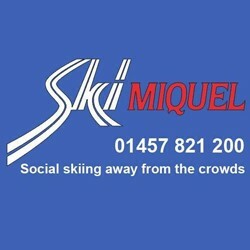 Fun all the way but with a real purpose and some excellent results. A great international opportunity for our kids to play, compete, watch, meet, admire others and learn. But it’s also great for the parents to chill out, follow a series of super games across a range of age groups, and watch the kids grow in confidence. Both on and off the pitch you are a formidable team of energetic motivators for our children, and we are so grateful. Thanks very much for a top, top, top weekend of hockey. Your efforts to get all the admin and logistics to get the weekend to happen were much appreciated. Not only was the hockey great but I have to say the kids were excellently behaved and will have learned a huge amount from the experience. Hearing the whole club cheer at the awards ceremony was a memorable experience. It felt like the whole club was behind each team and something we should cherish and encourage more at home games. Also great to see the girls enjoying the experience and they will no doubt keep on improving after seeing and playing some great hockey. See you at the club soon or our tour to Kazan!!!! Same from me to All. Fantastic weekend and Super Company. My son was exhausted this morning, so he certainly used up all his energy over the weekend, which is good to see! Thank you for all you put in to organising the team (and the parents!) in Barcelona this past weekend. We had a great time, watched some good hockey and came home with a trophy. So, not a bad weekend all in all even though we would have liked the other trophy! The boys really enjoyed it too of course. Thank you for your time and effort which is much appreciated. It was a top top weekend and the boys behaved brilliantly. The 2nd place will give some good motivation for the rest of the season. Add my thanks too, great weekend, and for u12 girls a real eye opener. Fab to have them invited. If I'm quick enough I will be able to add my thanks to the organisers and the club as a whole in expanding this tournament to include the U14 Girls. After being warned of the very high standards I can admit to having some concerns that our girls would be tested ... But thanks to a very committed group of girls and Mo's steady hand on the coaching tiller we delivered some good results and best memory for all of us was a hard fought draw against the eventual runners ups in front of a wildly enthusiastic GHC support unit. Just to say my daughter had an amazing weekend with you, the coaches and the other girls. She was so sad it was over this morning and wants to do it all again. So, thank you to the coaches and also to the girls for looking after her. A big thank you to all who were there looking after the girls, I know my daughter had the best time!! On Monday she was quite disappointed to be going to school, not playing hockey!! Particular thanks to Will for keeping us updated, looking after passports etc - it was lovely to hear progress reports over the weekend!! 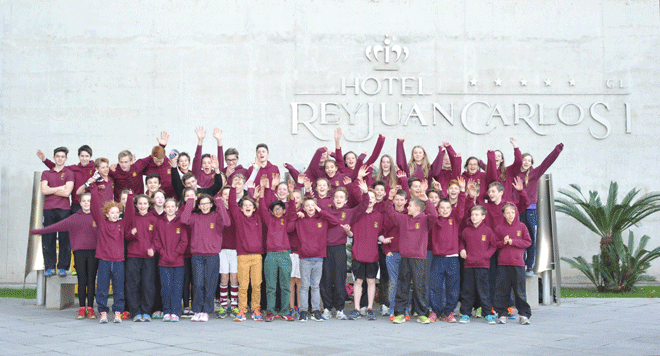 A really successful tour, enjoyable, both on and off the pitch. To see all the kids supporting each other was great and hopefully the adults found it relaxing. Not sure organising weekend breaks for 93 people is a thing to do too many times a year but to see 51 children enjoying their sport and a great bunch of parents enjoying each other's company makes it very rewarding! It was a team effort and the coaches and managers did a great job with their teams. To round it off, the girl who had 5 stitches in her chin in the back of an ambulance on the final day of the Tour went to training the next day back at Guildford and felt really good about getting back on the pitch!! I think that shows what hockey and GHC mean to these kids. If they are prepared to take the knocks and get on with it, then providing opportunities like this are invaluable!